Sponsored Riders - North Country Haven, LLC. 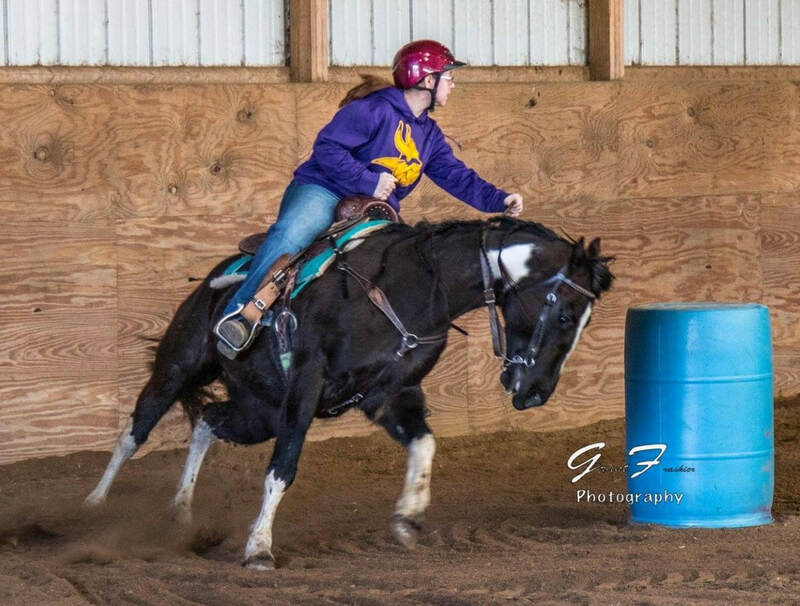 ​" Strive to promote good sportsmanship and horsemanship "
My name is Dakotah Winans, I am from Mountain Iron, MN. I am a physical/health education teacher at Hibbing High School. I have been riding horses since I was 13 years old. I started riding competitively about six years ago. I became a fan of the sport of barrel racing watching the Bemidji Rodeo with my family at a young age. What I enjoy about the sport is the adrenaline rush of running up the alleyway with a powerful animal and experiencing those moments where all the hard work and effort come together in a run. I enjoy riding horses because of the continuous life lessons I’ve learned over the years such as overcoming adversity, responsibility, work ethic, and how to pack for all the unexpected events that could occur hauling to a barrel race ☺. I would like to say thank you again; I’m truly honored and grateful to be a part of the sponsorship program for North Country Haven, LLC. I am 21 years old and have always loved horses. I rode at summer camp when I was 14 and was hooked. I babysat for a neighbor and earned enough money to take a barrel racing lesson at North Country Haven, LLC. However, with my age I was unable to earn enough to continue lessons. Luckily when I was 15, I learned of the Forget Me Not Foundation and began volunteering to spend time with horses at Rocky Meadows near Buhl and at the main barn in Nashwauk. I started riding a Paint mare named Ella and she became my 16th birthday present. We competed at the county fair in 4H and eventually at other local shows, most commonly at Rock Island Ranch in Grand Rapids, the Balkan Saddle Club, and the Flying Lead Saddle Club. I mostly train towards competing in the barrel racing however I’d like to do showmanship and English classes at the WSCA shows. I am a proud mother of two children, Aria and Derek (you may have heard about Aria from her AFM case that began in September) and am engaged to their father. In the future I hope to work with horses professionally, competing in barrel racing and training/selling project horses but I’m open to trying anything that involves horses. My goals for this upcoming season are to first focus on rebuilding my mare’s foundation, get both of us back into shape, and continue to compete locally at the saddle clubs, WSCA, and NBHA if the chance comes. Ella will also be used as a physical therapy horse for Aria and if her trunk muscles become strong enough, I hope to begin lead-line showing with them. My name is Morgan Gibson, I am 14 years old and a student at Virginia high school. I’ve lived on a farm in Embarrass, Minnesota my whole life. I am currently a member of NBHA and MPBA. I started riding horse at the age of three and have never looked back. I started competing in horse shows, 4H and riding in parades around the age of five on my ponies cowboy and Tully and have ridden many horses up until now. Two years ago, we welcomed Tarinos Col Dickens to our herd. Tarino was a trail horse and very shy. I trained him on the barrel pattern in the summer of 2018 and started entering him in as many barrel runs as I could get to. 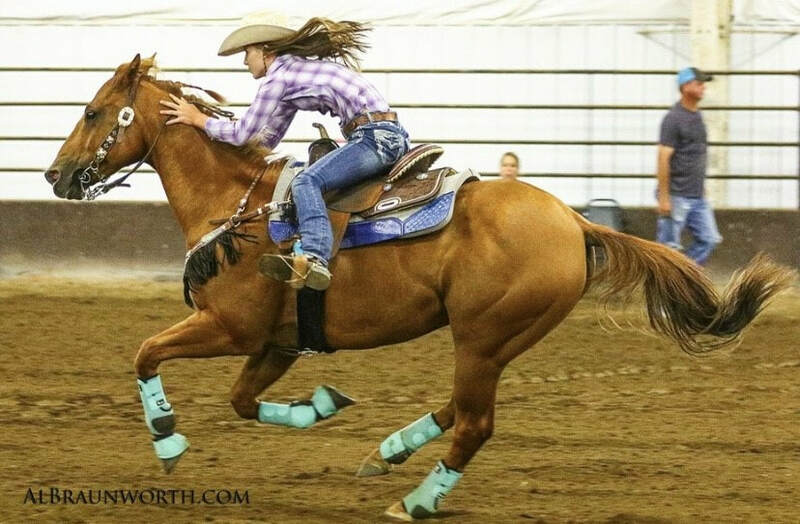 In 2019 I hope to run in Sherri Cervi youth championships, NBHA state finals, and as many barrel runs as possible. Tarino and I have come a long way with many ups and downs on our journey. I look forward to what the future has in store for us. I am honored to be a part of your team.